Maltodextrin, Cross Flow Ultra-Micro Filtered Whey Protein Concentrate, Fructose, Natural & Artificial Flavors, Dutch Cocoa, Calcium Caseinate, Vitamin & Mineral Blend (Di-Calcium Phosphate, Magnesium Oxide, Ascorbic Acid, Vitamin E Acetate, Biotin, Niacinamide, Potassium Iodide, Zinc Oxide, Electrolytic Iron, Vitamin A Acetate, Copper Gluconate, D-Calcium Pantothenate, Vitamin D, Pyridoxine Hydrochloride, Riboflavin, Thiamin Mononitrate, Cyanocobalamin, Folic Acid), Whey Protein Isolate, Creatine Monohydrate, L-Glutamine, Ace-K, Sucralose, Milk Protein Isolate, Egg Albumen, Cellulose, Fibersol-2 (Fiber). may be taken right after a workout or any time of the day to increase protein and calorie intake. Maltodextrin, Cross Flow Ultra-Micro Filtered Whey Protein Concentrate, Fructose, Natural & Artificial Flavors, Fibersol-2 (Fiber), Calcium Caseinate, Vitamin & Mineral Blend (Di-Calcium Phosphate, Magnesium Oxide, Ascorbic Acid, Vitamin E Acetate, Biotin, Niacinamide, Potassium Iodide, Zinc Oxide, Electrolytic Iron, Vitamin A Acetate, Copper Gluconate, D-Calcium Pantothenate, Vitamin D, Pyridoxine Hydrochloride, Riboflavin, Thiamin Mononitrate, Cyanocobalamin, Folic Acid), Whey Protein Isolate, Creatine Monohydrate, Xanthan Gum, L-Glutamine, Beet Root Juice Powder (Color), Cellulose, Ace-K, Sucralose, Milk Protein Isolate, Egg Albumen. Maltodextrin, Cross Flow Ultra-Micro Filtered Whey Protein Concentrate, Fructose, Natural & Artificial Flavors, Fibersol-2 (Fiber), Calcium Caseinate, Vitamin & Mineral Blend (Di-Calcium Phosphate, Magnesium Oxide, Ascorbic Acid, Vitamin E Acetate, Biotin, Niacinamide, Potassium Iodide, Zinc Oxide, Electrolytic Iron, Vitamin A Acetate, Copper Gluconate, D-Calcium Pantothenate, Vitamin D, Pyridoxine Hydrochloride, Riboflavin, Thiamin Mononitrate, Cyanocobalamin, Folic Acid), Whey Protein Isolate, Creatine Monohydrate, L-Glutamine, Cellulose, Ace-K, Sucralose, Milk Protein Isolate, Egg Albumen. 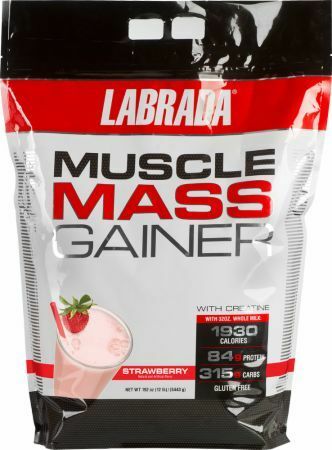 Muscle Mass Gainer comes in 6 & 12 lb. resealable gusset bags, in Vanilla and Chocolate.
" 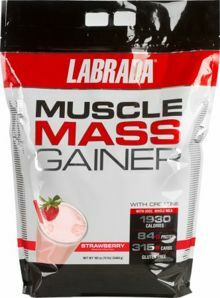 Muscle Mass Gainer is perfect for young athletes and hard gainers who want to increase their caloric and protein intake to gain weight fast! It makes a real powerhouse of a shake that's sure to help them pack on new body weight." -Labrada Nutrition CEO and IFBB Pro Bodybuilding Hall of Famer Lee Labrada.